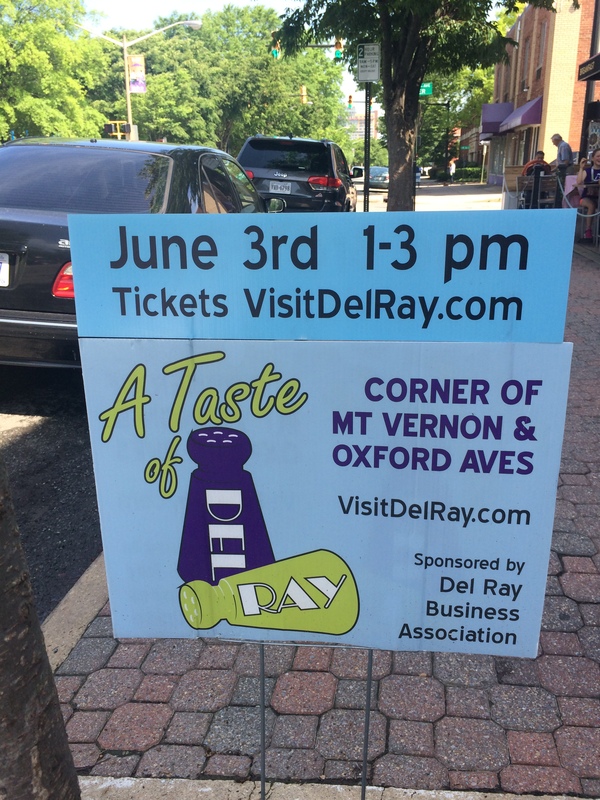 The 10th Annual Taste of Del Ray is coming! It is Sunday, June 3 from 1:00 – 3:00PM. A delicious variety of food from a number of neighborhood restaurants will be offered. Ticket holders can enjoy unlimited tastes from top Del Ray restaurants. And then you can cast your vote for the People’s Choice award. The event will take place at the Pat Miller Neighborhood Square and the parking lot behind United Bank (Mount Vernon Avenue and Oxford Avenue). Participating restaurants include local favorites: Cheesetique, Evening Star Cafe, Junction Bakery & Bistro, KAiZEN TAVERN, Lena’s Wood-Fired Pizza & Tap, Live Oak Restaurant, Los Tios Grill, Nectar Coffee and Wine Bistro, Northside10, Pork Barrel BBQ, SnackBar, St. Elmo’s Coffee Pub/ Market 2 Market Del Ray, Stomping Ground, Swings Coffee Roasters, Taqueria Poblano Del Ray, and The Happy Tart Del Ray. Advance tickets online are $15 per adult and $5 for children under 12 years of age. Or you can purchase tickets in person at The Neighborhood Pharmacy of Del Ray, Greener Cleaner of Del Ray, and at the Del Ray Farmers’ Market. Day-of ticket sales will begin at noon, if available but only 1,000 tickets will be sold and it has sold out during pre-sales in the past. So don’t wait!